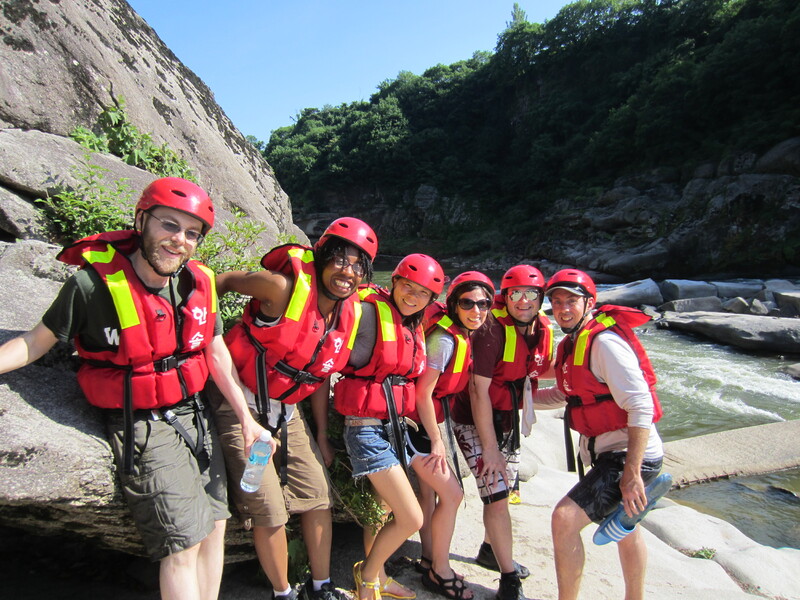 The whole rafting crew. 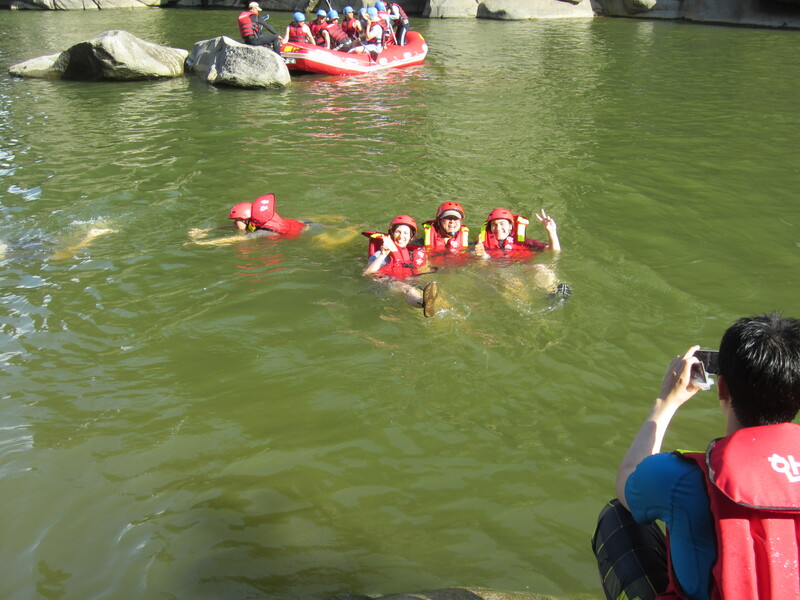 We took three rafts. 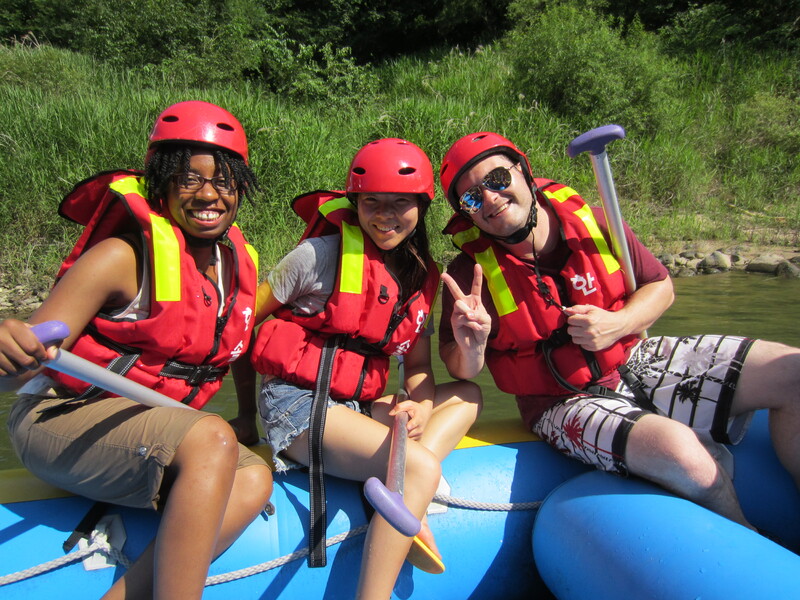 A couple of weeks ago, we went rafting. 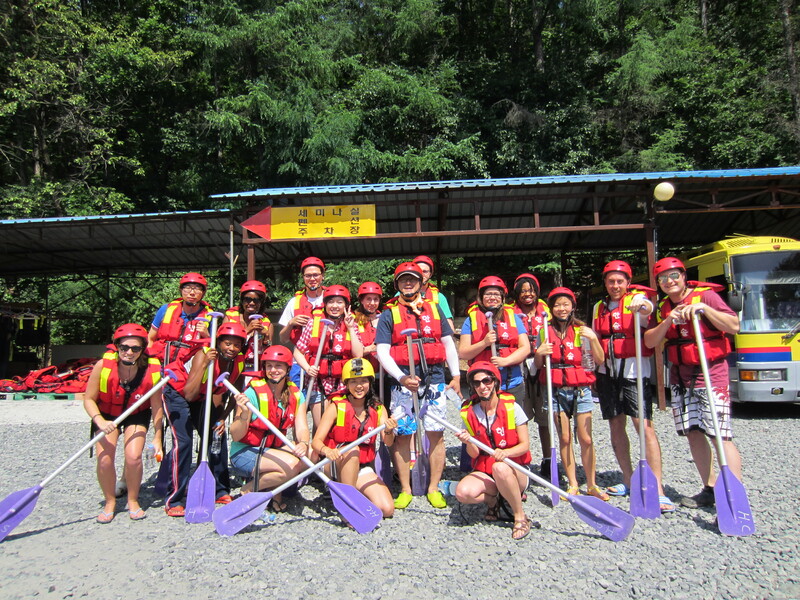 Cheorwon is known for its rafting, and we were lucky enough to get hooked up with free rafting from a friend of a friend who is a local photographer. He is working on a video and photo project of the area and wanted some photos of foreigners. But there were still a few exciting moments. 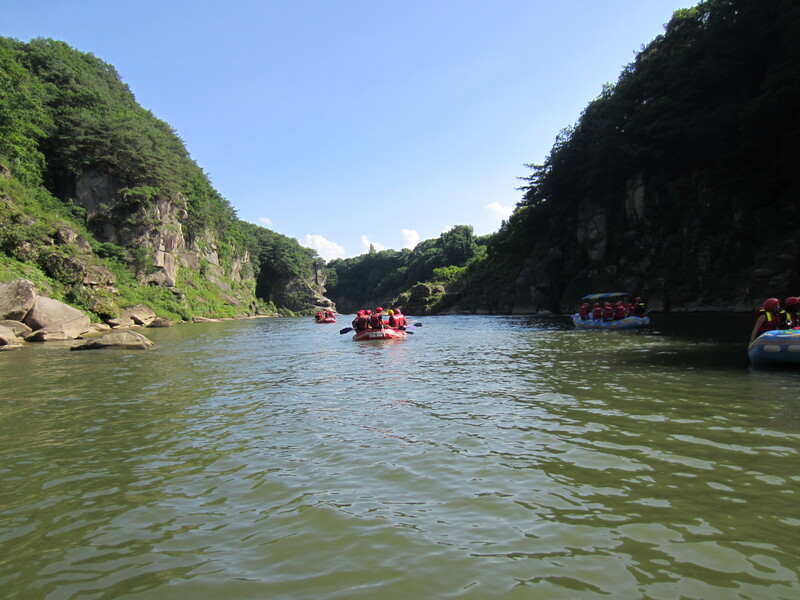 Right when we started, there were some rapids that our guide thought we should not go over. 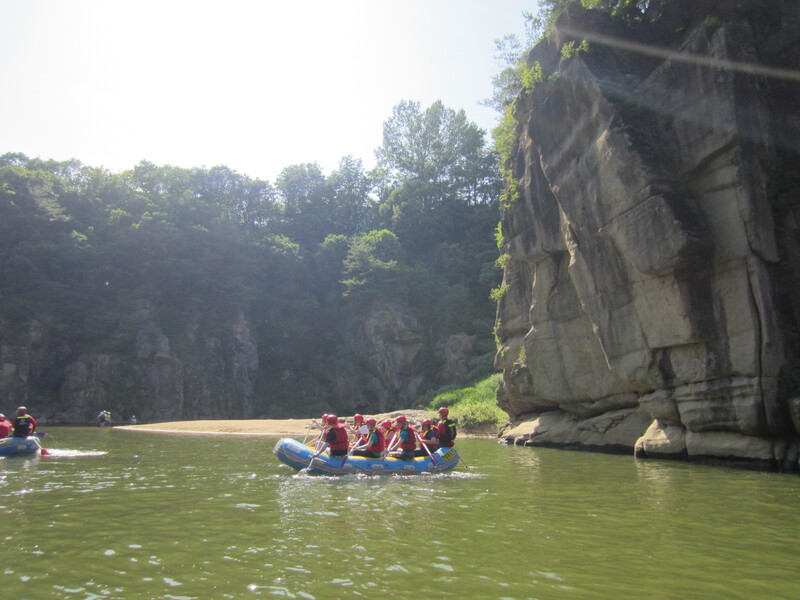 So he asked everyone to get out of the boat and walk down some rocks past the rapids while he guided the boat down. The rocks were slippery and the current was strong, so it took some fancy footwork to get to the shore without falling. 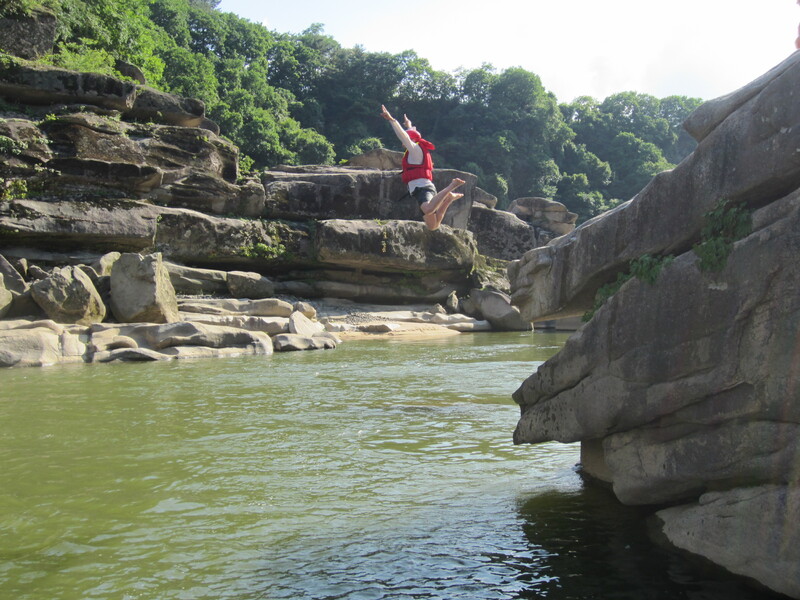 … You may remember Ben from my “hiking Geumhaksan” blog. 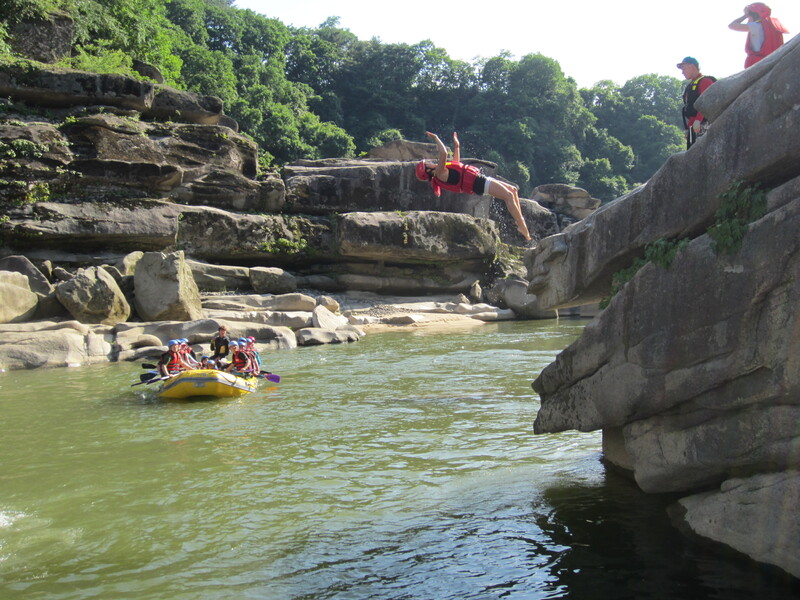 After climbing out of the raft, he immediately fell, knocking the raft and dislodging it from where it was wedged on a rock. 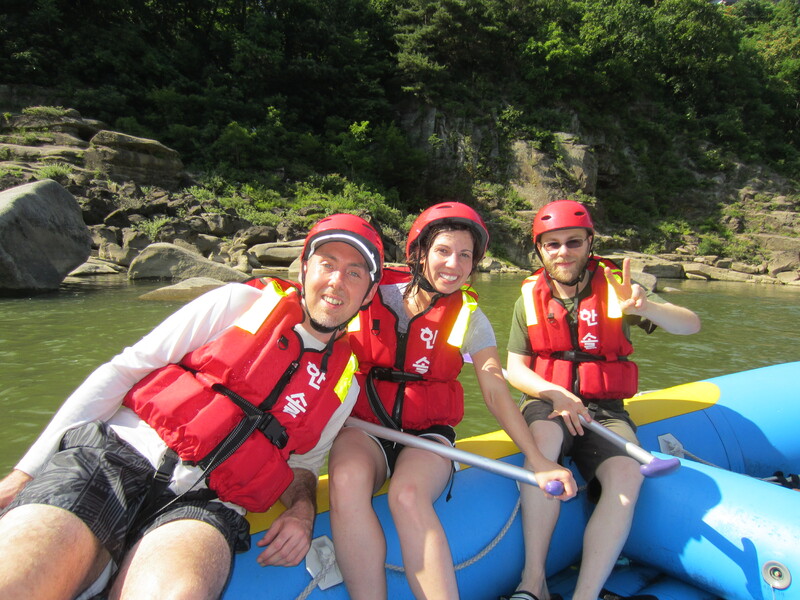 This sent the raft on its way toward the rapids, with the guide and Matt still inside! 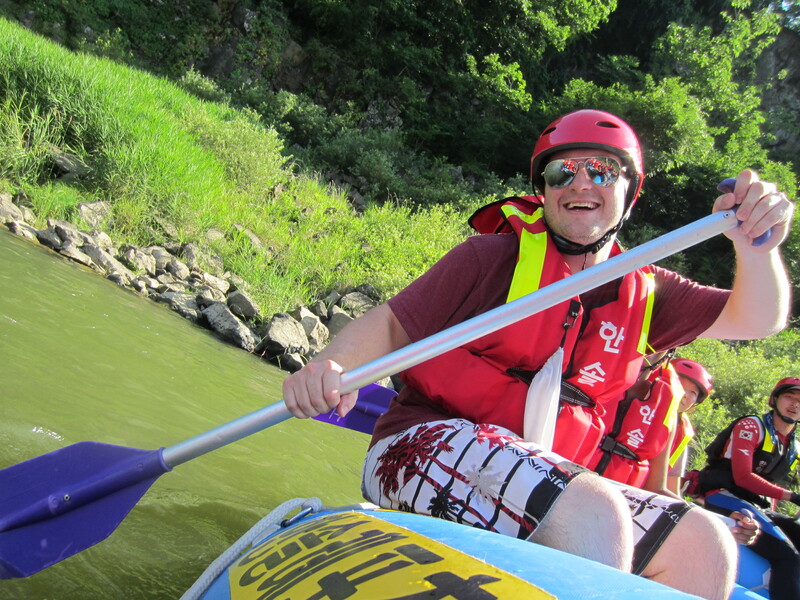 He instructed Matt to sit in the middle of the raft, and Matt got to enjoy quite the ride. Of course, I didn’t see any of this because I was busy with my own fancy footwork making it to shore. So when I turned around and saw no boat and no Matt I wasn’t sure what to think! Gasun showed off with a flip. I think my noseplug and closed eyes outdid her though. 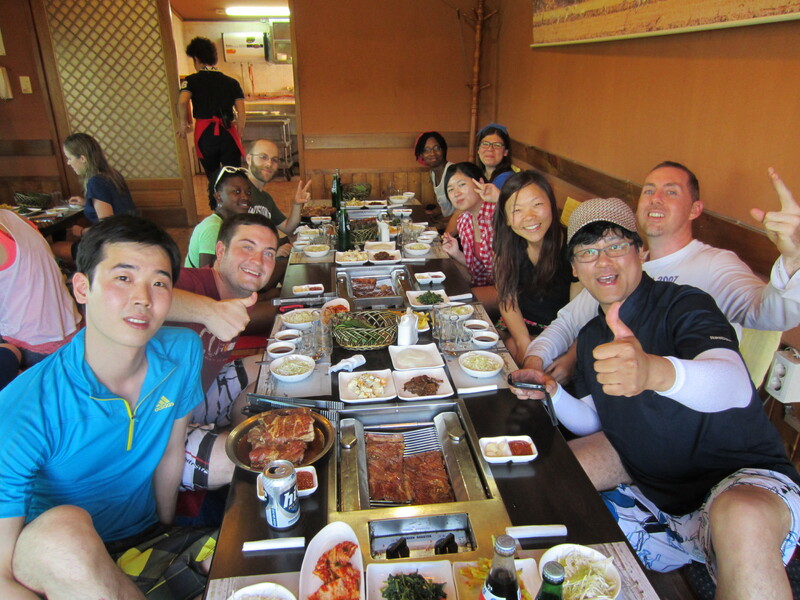 We finished up rafting with a fancy meal of galbi, which is meat you grill yourself at the table. The restaurant overlooked the river and was really nice. Then some of us met up at the bar in Dongsong for drinks. We ended up having quite the exciting time and met a lot of random people throughout the night. All in all, it was quite a fun weekend in Cheorwon. 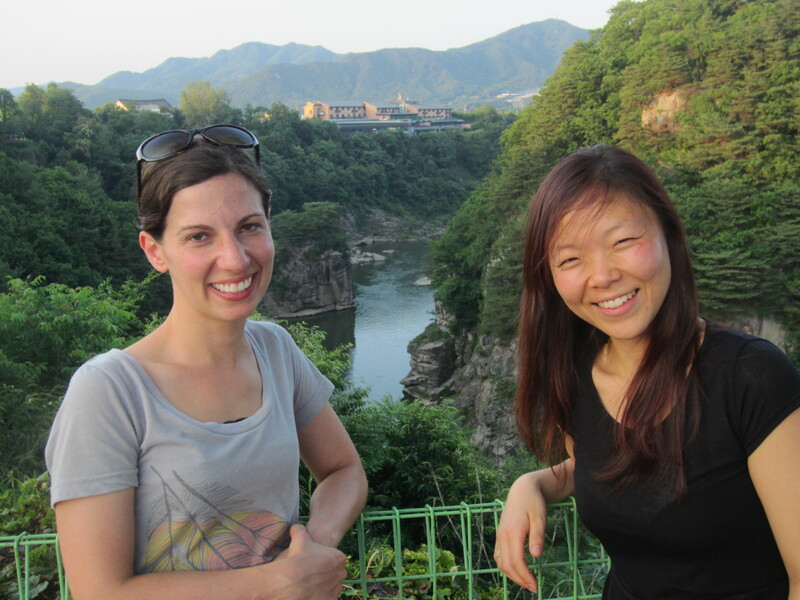 Lim and I overlooking the Hantan River after dinner. Another great adventure story! (Although probably scary for Matt for a minute!) So many happy faces. Looks like a blast…i’ll have to remember to ask Matt about this the next time we talk…..thanks for keeping us all posted! Somehow I believe you guys are going to do more traveling before you ‘take root’ any where! And I believe that would be a good thing!! What great fun it looks like….. did I read ‘nose plugs’? You must have been on camera duty…Love the pictures..